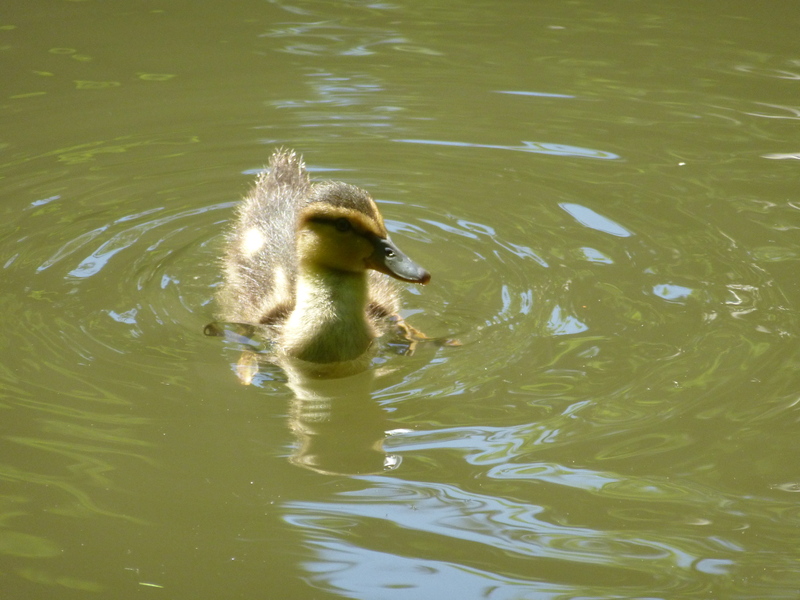 An adorable duckling foraging in the lily pads. He looks suspicious. 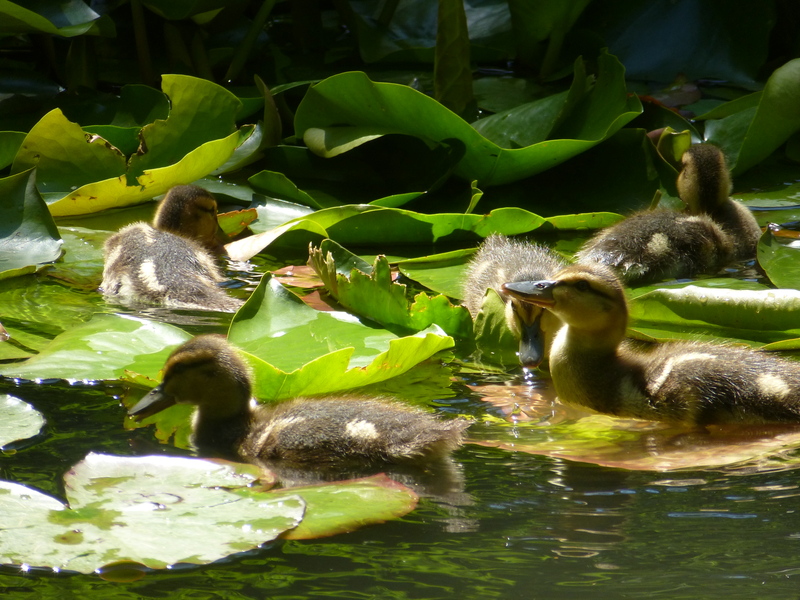 They all forage in the lily pads. I’m not sure what they’re eating there: perhaps insects. 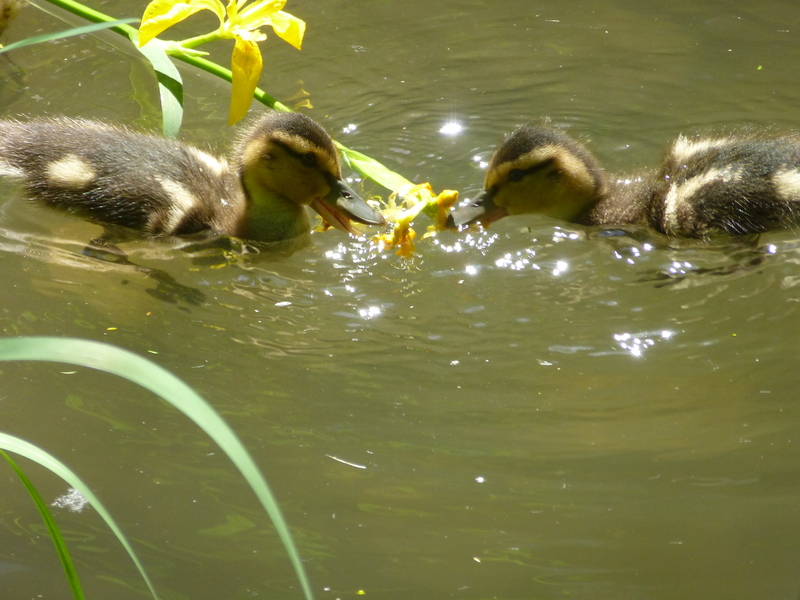 Two of the brood nibble on an Iris in the pond. I guess they were just tasting it. This entry was written by whyevolutionistrue and posted on June 3, 2018 at 2:30 pm and filed under ducklings, ducks. Bookmark the permalink. Follow any comments here with the RSS feed for this post. Both comments and trackbacks are currently closed. These pics are SO good, so cute! They’ve made me smile. Thanks! Last year there were two ducks? Now there are eleven. My guess for 2019 is btwn 50 and 60. No, there were five last year: Honey and a brood of four. All four fledged, and Honey returned this year, which delighted me. … as Randy Schenck said, this qualifies me as a Duck Farmer. Long as you’re layin’ off the gavage, boss, we cool. I so enjoy the updates. They are such cute ducklings. Their feathers look almost like fur in the pictures. Duck farmer? So when do we get to see you in coveralls and a straw hat to go with the appropriate boots? What he needs to do now is check in at the local FSA office (farm service agency) and see what services he might apply for. Based on his acreage and number of livestock he may be entitled to some benefits, maybe insurance, you never know. He would be Cook county. I’m kidding but hey, you have to play the part. He already has the cowboy boots so Duck Wrangler would be the title. 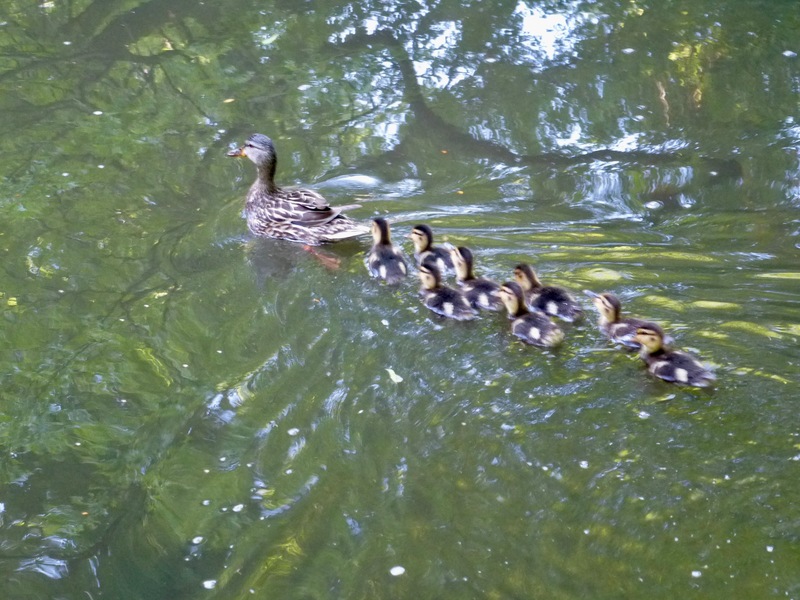 Is there a duckling subsidy, I wonder? to me, the concept of farming involves some sort of harvest. In these circumstances I would not like to be called a duck farmer. What’s poisonous depends on who you are, and I think almost all plants are poisonous to some creatures. Asparagus is apparently deadly to horses, for example. Also parts of a plant vary in their toxicity, and petals seem to often have less of the weird secondary compounds than leaves. The babies look so soft. I wonder if they’d let you pick them up. I can’t get close to them, though I did pick up two when they were trapped in the central “ring” when the water level was too low for them to jump out. 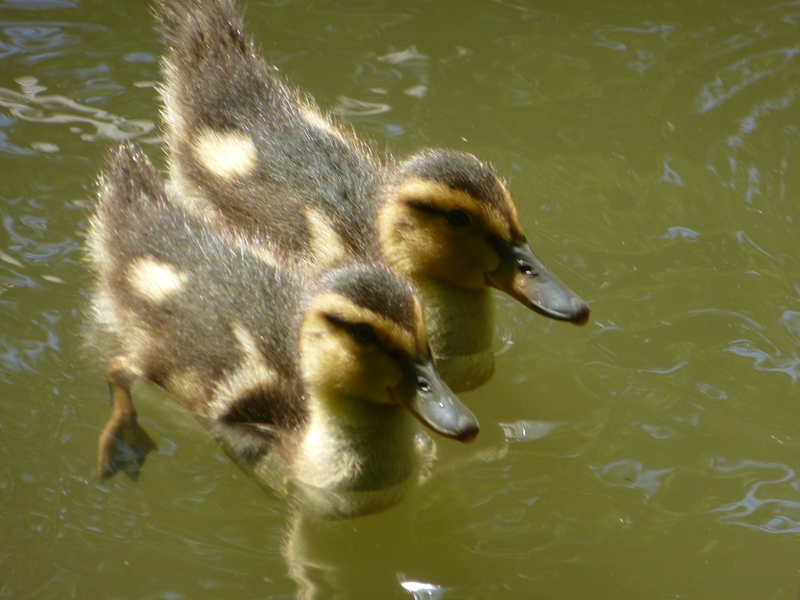 I waded out there and gently lifted them out into the main pond, where they rejoined their siblings and honey. They were light as a feather, and plenty scared, so I didn’t hold them longer than it took to scoop them out. They were soft. When they got bigger last year, I could pet them a little, but that’s when they were much older, and they didn’t like it much. 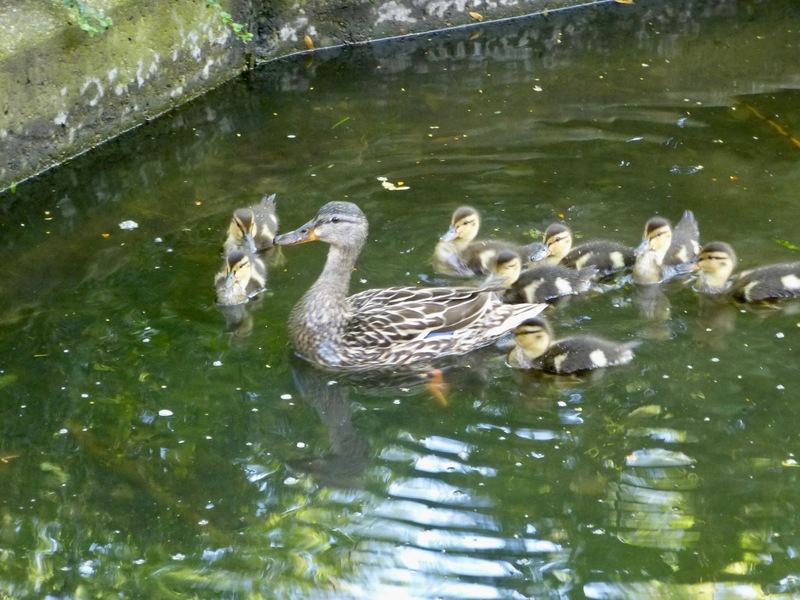 The ducklings will feed on the dragonflies in the pond. There is video of this. One of Jerry’s colleagues, Michael LaBarbera, gave a talk back in 2009 where he shows video of this. He was studying the dragonflies and shooting high speed video. Which is incredible when slowed down. On his homepage, he has 45 seconds of a duckling eating a dragonfly. It is slowed down high speed video. He was shooting high speed video of the dragonflies. Scroll down to the bottom of the page – not updated in a while. It says to use Quicktime which was discontinued a while ago. Other video players (like VLC) play it. 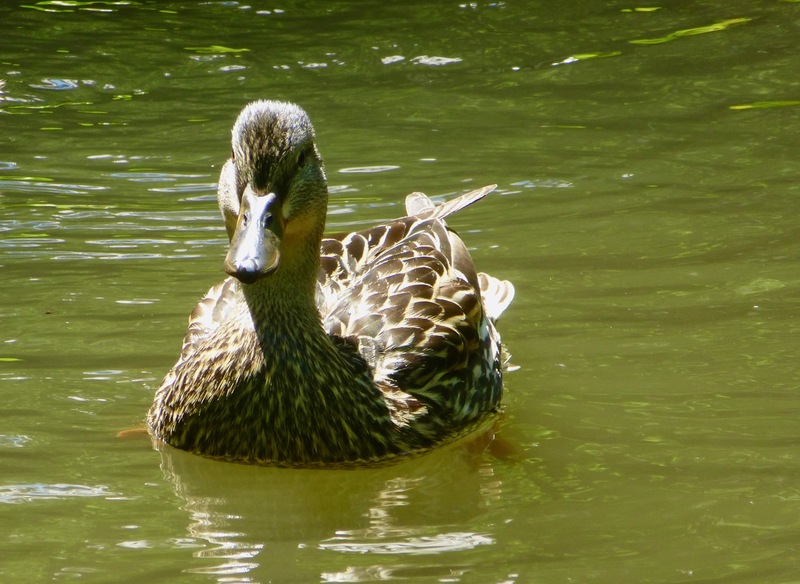 I meant a duckling trying to eat a dragonfly – he/she missed. Thank you so much for the links! I didn’t expect to but found myself watching the whole thing. The Q & A were great! LaBarbera is a very good speaker. I really enjoyed his presentation. I just wish the camera operator did a better job of showing his slides and videos. You do start thinking about those ducklings as killers and not cute little puff balls. 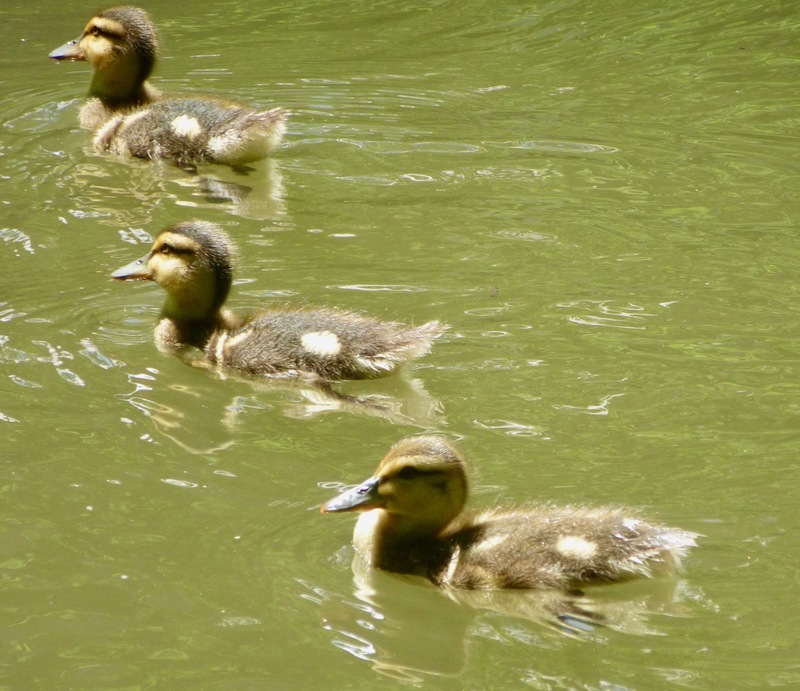 With all due deference to Honey, the mother in 2009 was phenomenal – 12 of 13 ducklings survived. Maybe Honey was one of her progeny. 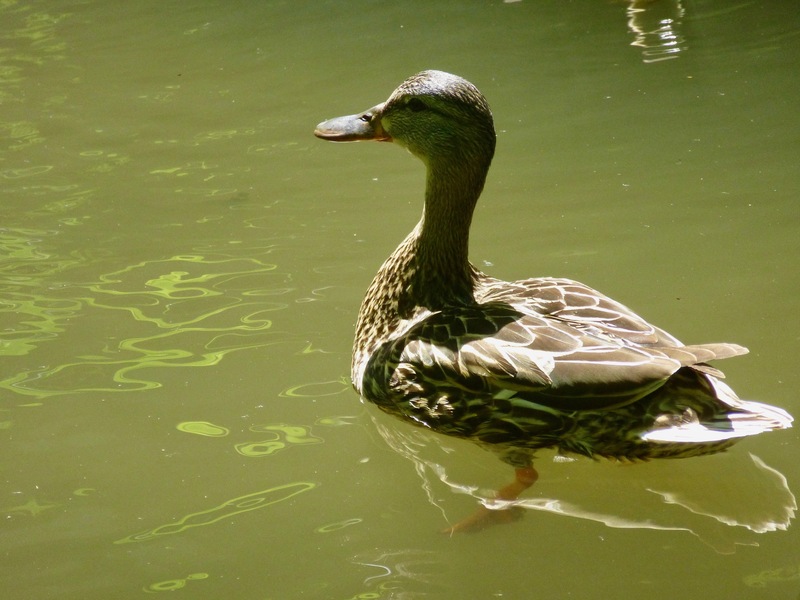 Lifespan of a mallard duck is 5-10 years so a possibility. This talk was given on Alumni Weekend – which is always the first weekend in June. He mentioned that the most current pics were taken on the 31st – which I take to be May 31. So about this time of year. Alumni Weekend was this weekend. I was on campus but could not make it over to the pond. 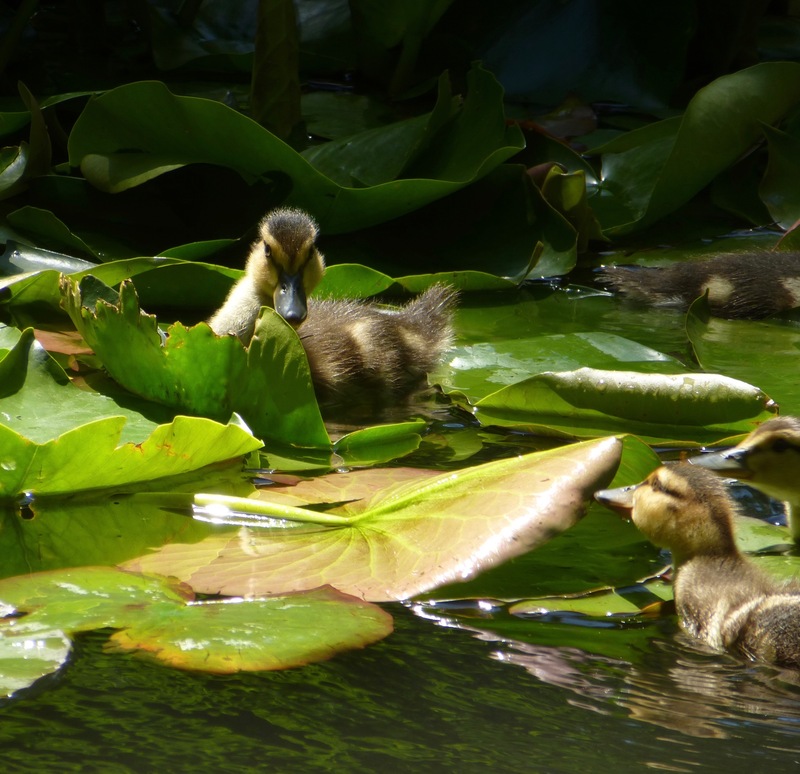 Your ducklings have hit an evolutionary jackpot, an emeritus professor looking after them! However, I’m not sure if this advantage will be sustainable in the longer term. It might be, if you can (I’m sure you can) infect future generation with comparable love. It’s you blog, but enough with the dicks! Ladies and gentlemen, here we have a prime example of someone who is presumably normal in real life (I can’t vouch for that), but becomes an insufferable boor online. Goodbye, Mr. Collier. Your post is not only rude and a roolz violation in several ways, but has two misspellings in eight words, an illiteracy index of 25%. I really have no idea why people like you turn into jackasses on the Internet, but I have no need for the likes of you here. And, enough with the dicks it is. I just saw a video on duck penises and their often violent mating habits. Weird yet fascinating stuff. Jerry may qualify as a duck farmer, but these photos look like they were taken by a proud father. As the Official Duck Caretaker of UC, hope that you are keeping an album to look back on, in your later years. Birds can look so stern sometimes.